What a faff! Several garages wouldn't touch the job with a barge pole and I'm guessing for good reason. Firstly there's the issue competence/confidence in providing a satisfactory job on car balance and setup. There are many variables with a coil over install that several of my local garages weren't comfortable with. I found a place locally however who were experienced in building project cars, track cars etc and were happy to fit them. Although with hind sight they might not have been so willing. Installing coil overs isn't a big job if you know what you're doing. 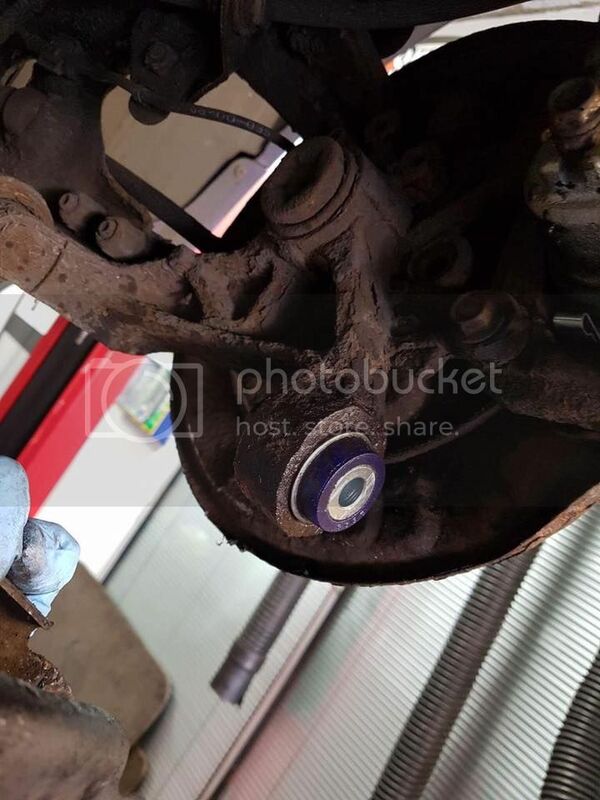 These guys were even able to connect up the self-levelling headlamp sensor to the front shock, something the BC website says it's not compatible with, so kudos to them for that. The problem comes with the age of the car. 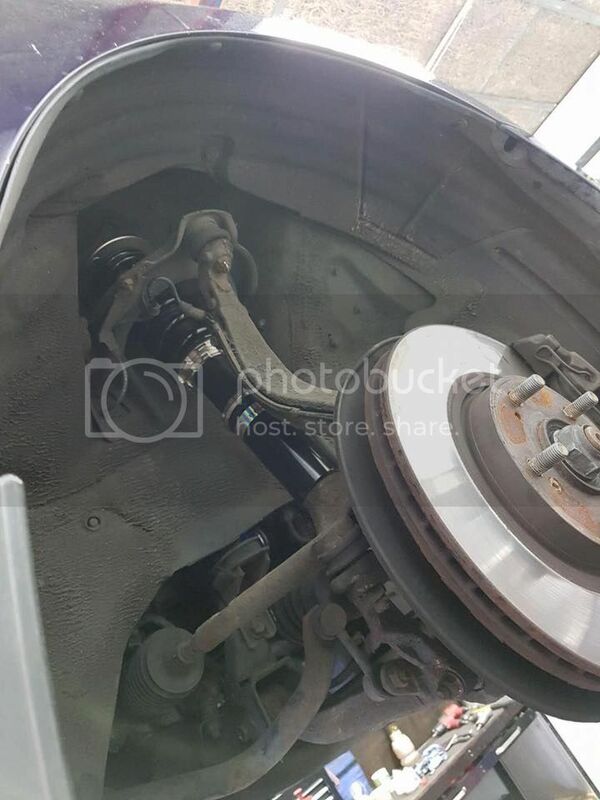 The rear suspension components were very badly seized and the outer, lower trailing arm bolts and bushes had completely seized to the trailing arm. The only option was to cut them out and replace the bolts and bushes (something not discovered until the first attempt at install). Due to the closeness to the hub, cutting them without impacting on the rest of the area was tricky. Using an electric saw and a thermal something or other they were able to heat and cut the bolts out. This left the bush in place. The bush has a heavy steel sleeve and this had completely seized and bonded to the trailing arm. No amount of force would do it, so they had to drill it out. A long and arduous process, as anyone who's ever had to drill through strong, thick steel will tell you. This meant the car spent a great deal longer on the ramp than they expected and the cost therefore was significantly more than I expected, but they were really nice guys and stuck at it, and didn't charge me for all the time as they knew I hadn't budget for so many man hours. They were reasonable and met me in the middle of the original quote and what the final bill should have been. Much respect to them for that. So I picked the car up yesterday (Friday) and today (Saturday) I did a couple of hours driving on A-roads and twisty country roads. The car was already low. I'd lowered it several years ago on Apex Spring. The drop was about 35-40mm and at first things felt great, but over time it was clear my shocks weren't doing their job properly (premature wear due to the lowering springs increasing stress/load on the OE shocks). The car was bouncy, boat-ish and whilst it looked great parked up, it handled like plop and on winding roads I couldn't keep up with old ladies in silver hatchbacks as I didn't have the confidence in the bends due to significant body roll and lack of downward force on the wheels to the road. The car would skip and bounce over uneven surfaces, and sometimes under braking, which was a little scary at times. That's all changed. It's currently sitting a little higher than it was on the Apex, but will likely bed in a few more millimetres over the coming days. They said to bring the car back in a week or so for any tweaks to height (free of charge). Despite being higher, it's way more composed and planted. I have so much feedback from the road and car in general. I can really chuck it into bends and it stays much more level and doesn't feel anywhere near its limit. For the first time ever today I felt like I'd be comfortable taking it for a track day (all be it a light hearted track day, nothing too serious). It doesn't rear up when you put your foot down and it doesn't lurch forward and nose dive when you brake. As mentioned the body roll is significantly reduced, the stance is an even height on the front and back (it was always lower at the front on the Apex) and bumps are now happily tolerable. I've gone from having a car that was crashy and uncomfortable over bumps to one that absorbs and cushions without any fuss. 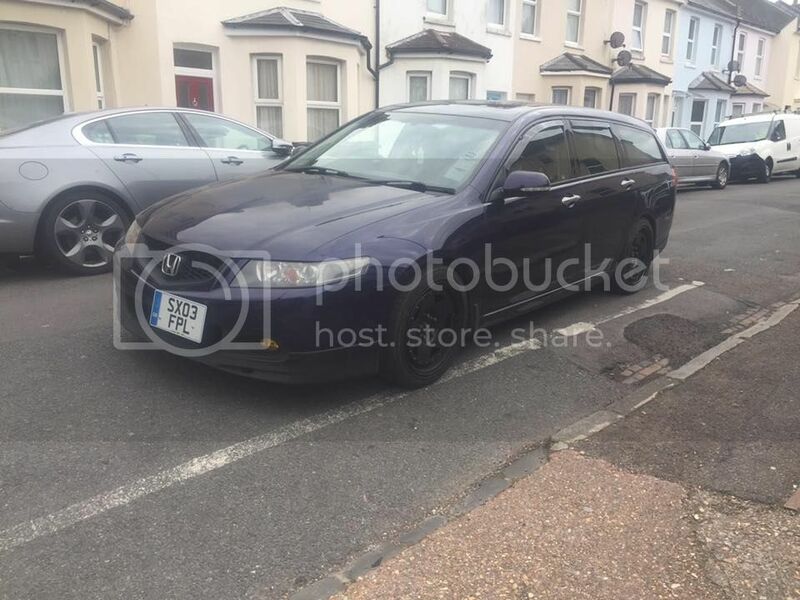 Whenever I've driven a newer car, I've always thought that whilst it was more boring than my Accord, it was much more comfortable and smooth over uneven surfaces. Not any more. From a smoothness over bumps point of view, the car feels like a new car. It's not a cheap job. You can go look up the price of the parts and then add several hours labour on that. In my case, it slightly spiralled as extra labour, bolts and bushes came in to play. It's going to be a lean couple of months now to make up for it . If you're thinking of fitting coil overs, and like me, your car is early 2000s, have a trust worthy mechanic look over everything and check for seizing before embarking on an upgrade. That way you'll go into it with a better understanding of additional parts and labour, as opposed to having a sting in the wallet like I've had this week. It's also highlighted the matter of the rest of my suspension very much showing its age. As I walked around the underneath of the car on the ramp, I could see that ideally all the bushes in the suspension will want replacing before too long as they look old and tired. Whilst out driving today I noticed a knocking rattle coming from the rear nearside which I'm suspecting is the something that's taken offence to all the work and install and is likely going to want replacing soon. Perhaps drop links, or another part of the trailing arms. I'll have them look at it when I drop it in to have minor adjustments next week. The Coilovers themselves, I can't fault yet. They were well packaged, very solid feeling, they look made to a very high standard. 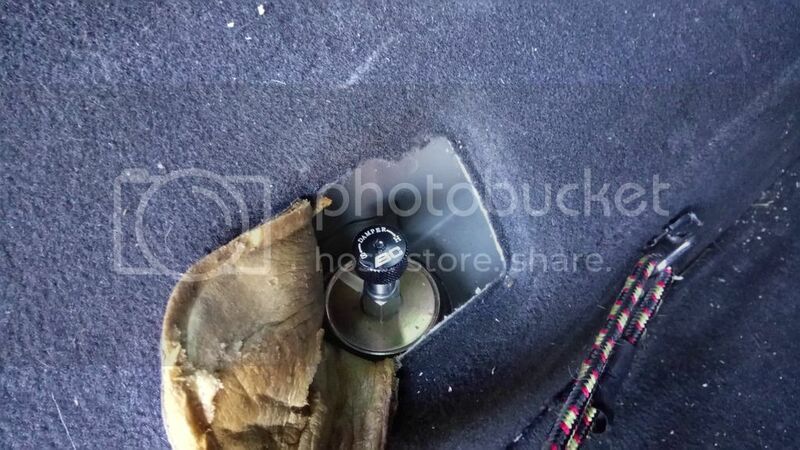 Once fitted you can adjust the firmness of the dampening by turning a knob on the top of each strut. Super easy to do. I've set mine in the middle and haven't tried firmer or softer yet. I expect I could go a few click firmer and a few mm lower on the springs in time. But right now the car is such a joy to drive, I don't feel the need to change things yet. I massively recommend BC Racing. These were the only coil overs I could find in the UK for the Accord Tourer that weren't bonkers money. They're the BR Series, which is their entry level road and mild track use coilover set. They come with good info (and stickers ), are super easy to understand and adjust and I can't remember the car ever feeling so good to drive. From now on, whatever car I have in the future, coilovers will always be the first mod. I've heard others say it, and they're right. The performance improvement from the handing has to be experienced to be understood. If I could do my car modding journey again, I'd begin it with coil overs as it's clear how they let you get the most out of a car. Fit them before the car gets too old and you can still undo and reuse bushes too . If you're thinking of doing a similar thing to your car, feel free to ask questions in this thread. There's not much to photo really as you all know what coilovers look like, but I'll take some snaps tomorrow for anyone who's interested. And what you saloon guys may not realise, and why it's generally harder to find companies who supply coil overs for the tourer is the rears aren't really coil overs... 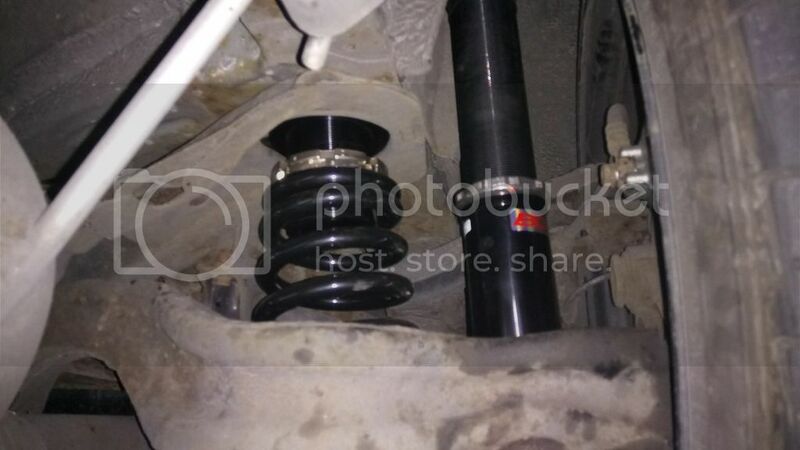 It's a trailing arm setup so the spring has a special adjustable top hat fitment that allows you to adjust the spring rate, the same as coil overs, but not technically over the shock. And here are the photos the garage took while doing the work. And this is where the car was sitting (height wise) on Friday when I picked it up. It's lower than stock, a touch up on where it was with the Apex. Like I mentioned above, it's a world apart, from how it drove before. Whilst the Apex springs are good, they eventually totalled my original shocks and I'd recommend either lowering spring and shock upgrades together or to go the route of coil overs. Springs alone eventually make the shocks give out. That should do for now. Next on my to-do list is to give the car a thorough detail ready for JapFest this time next week . Looks good Steve. I'd forgotten about the change to the fat steelies. Nice to see that it all worked out in the end, even though it was such an ordeal getting there by the looks of things. As with any adjustable shocks, it's probably worth dialling the compression off and taking it easy for a couple of days to bed them in quicker, then put them back to the original settings. It'll dramatically cut down the bed-in time. I normally do this on every new motorcycle I get while I'm running the motor in. In the same manner, when I fitted new (non adjistable) Bilstein B8's to my Subaru, it took approx 2-3k miles for them to bed in properly and become as plush as when I bought it. Edited by Goodluckmonkey, 23 April 2017 - 09:35 PM. Good idea Matt. I shall do that. They're at the centre point at the moment, but I'll dial them close to max softness, like you suggest. I love the idea of being able to just dial in stiffness on my dampening. I've always been one for tinkering with my stuff. Computers, music equipment, my BMX and so on and I really like that the car now has shades of this too. If I'm doing family driving, or having to drive my parents somewhere, I can just ease it off. When I'm going out for a drive on my own, I can stiffen the shocks up. It's nice to have the option, even if I'm only adjusting them from time to time. You'll find that where they're compression adjustable, in a road car it's really just the comfort and wallow you're adjusting. The rebound circuit is what'll be supplying the grip. Therefore, there's not too much danger in winding it off loads to drive it round normally on its daily duties to bed it in. I'm a fiddler too. Yesterday the wife caught me weighing myself in all my riding kit so that I could double check the spring rates in my race bike against known data as I'm changing from a straight rate, to a progressively wound spring. I have a notepad and every time I ride a practice day, I make notes of which settings and tyre pressures work for varying conditions. Sad, maybe, but on a race day, I know I can turn up with a known good setting based on previous experience. It's vital when you don't get a practice or even a sighting lap, and you just go for it when the flag drops. Glad you are enjoying your new purchase. You are right coilovers changes the car massively. Oem to lowering springs is just a small step compared to lowering springs to coilovers, let a lone oem to coilovers. People these days are too obsessed with remaps, and call the car modded. If the car hasnt got the chassis to go quick then its only half done. Some new arms and bushes to finish it off under there, when the gold pot recovers, and youll be ready to drive it hard, as in trackday hard! Completely agree Marcus. As I said. Never again will I bother with anything on a car until I've done Coilovers. The knock's come back again today on the way home. Not sure what it is. It doesn't seem to relate to road conditions, seems pretty random, but very constant, deep, low, from rear near side I think. I just hope it's not the new parts being defective and is something I can easily replace, like a bush or drop link. I've emailed my mechanic, so will wait and see what he says. Hopefully he can look it over before Sunday so even if it's not fixed I can know what it is for peace of mind before heading up the motorway for JapFest. Start with a spanner check. Just make sure nothing has come loose, or was loose from the beginning. Check top mounts at the rear, those adjustable platforms, and more simple stuff. Also trim in the boot. 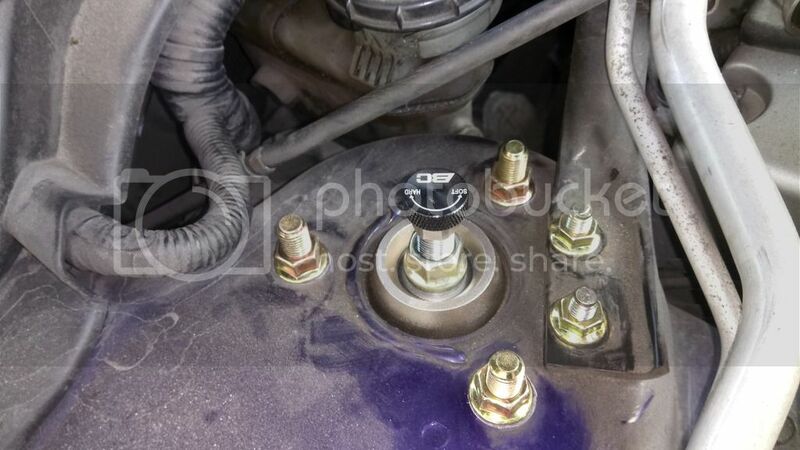 Yeah, I just read on all kinds of forums that BCs are prone to knocking and the top mount bolts needing a little more than what it says they do in terms of torque. Also whilst the manual says the preload is set at factory, UK reps have informed many people to reset the preload as they're not always set adequately in the factory. This could be something for them to check at the garage. I just went out and check the bolts, the Near Side rear had an extra 8th of a turn in it, whereas the off side wouldn't budge, so fingers crossed that will help. I'll see how it is tomorrow. Steve, Jack it up, wheel off, and see if there's any slack between the spring and the preload adjusting collars. If there is, just get the c-spanners on it. Nice review, thank you! Give us an update later when your setup will be completly finished. Seems to be a great upgrade for thus have still stock springs & shocks. For my side, I've already Bilstein B8 installed, so... But I think I've still original Type S spring. Are your old Apex springs for sale ? Hi Fabian. Yeah, I was considering the Bilsteins, they review very highly. But temptation got the better of me and convinced me to splurge on the coilies. I was gonna hold on to my old setup for the time being, just to be on the safe side, in case I needed to remove the coil overs for any reason, so they're not currently for sale (and the yellow coating is split in places and the springs look a bit nasty and rusty underneath the splits, so I'm not sure you'd want them in that condition). OK Steve. Do you have a pict when I can see how the tourer is lowered with Apex springs ? Is there any other choice of springs for the tourer (H&R...) ? I don't think it's much lower than my own CM2. I need to check my springs to see if it's already lowered or not. Edited by IloveJapan, 27 April 2017 - 03:33 PM. A bilstein B8 is the shorter version of the B6. I'd expect it to have lowering springs already. Well, the knocking stopped on Wednesday and the chaps had a look over everything on Friday and couldn't find anything, so fingers crossed the knocking stays gone. In other news, I bought myself a micrometer and had a little go at making adjustments today. Pleasantly surprised at how easy it was to adjust the ride height. 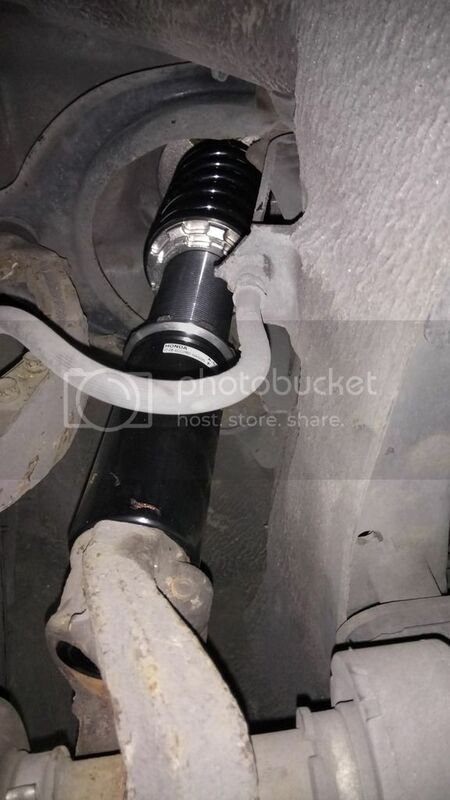 The design of these is that you can alter ride height without changing spring load, by adjusting the collar at the bottom of the shock by the hub. I found that since the install it's bedded in to be lower on the driver side at the from than the passenger side, by about 10mm. I wound ten mil out of the passenger side but then that seemed to also lower the driver side a touch. I guess it's a weight distribution thing. Anyway, I did some adjustments on both sides until they were the same (give or take a couple of tenths) and the overall stance of the car is very nice. It's a touch too low. I'll keep it for Japfest as it looks cool, but will probably wind ten mill back in to both sides soon, otherwise I'm going to scrape all the time, and as mentioned above, even with the higher ride height, the suspension is very tight and responsive. Glad to hear you are enjoying the tweakability. Ride height collar adjustment is useful to adjust height while retain damper travel. But with any adjustments to preload collar or ride height, comes corner weights. Raise a corner adds weight to that corner. And it works in diagnals. Also rememeber youll get toe and camber changes when going up and down. Something to consider is your tyre pressures. You might find it handle better with a few more psi to match the tyre rate with the new higher spring rate. As they will be out of sync if you are running stock pressure. Cheers Marcus, that's useful insight. I've always run my tyres about 36PSI, mainly for fuel saving. I'll probably raise the car up a touch soon, get new tyres and alignment/geometry/corner balancing done. Get it all setup and then leave it for a while. Nice write up. Finally had a chance (and remembered) to find this! I personally wont be buying BC again as conflicting info from instructions and BC UK staff, when i sent mine back for checks/warranty. Mine still knock slightly (but not on big potholes) and have tried and changed worn bushes/wishbone. Not knocking (pun intended) your set up mate. Glad you happy. There is just a minority who wouldnt choose BC again.